The USC School of Dramatic Arts invites families of current SDA students to join us for Trojan Family Weekend! The following are sessions offered by the USC School of Dramatic Arts during Trojan Family Weekend. To attend these events, you must be a registered attendee of Trojan Family Weekend. For more information, and to register, visit the university’s Trojan Family Weekend website. The only event that families may attend if they are NOT registered for Trojan Family Weekend is “USC School of Dramatic Arts Dean’s Reception.” Please see below for more information. For questions regarding SDA events, contact Kathy Morgan by email at kdmorgan@usc.edu or phone at 213-821-4262. Join Dean David Bridel for a reception and panel showcasing the USC School of Dramatic Arts (SDA) community and alumni. Engage with fellow SDA families and participate in an interactive question-and-answer session with Dean David Bridel and alumni who will discuss opportunities available in an ever-changing artistic landscape. 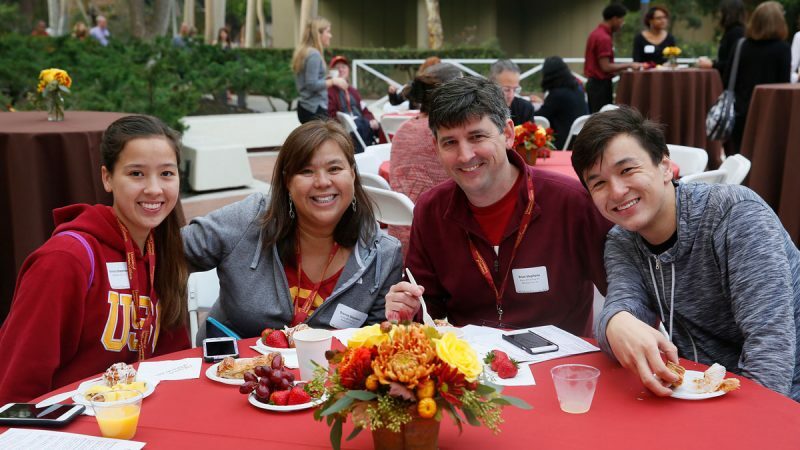 **If you are not registered for Trojan Family Weekend, but would like to attend “USC School of Dramatic Arts Dean’s Reception,” please email Kathy Morgan at kdmorgan@usc.edu with the following information: Student information (name, year and subject of study), your name, guest name and email address. Dean Robert A. Cutietta will be joined by Vice Dean Jodie Gates, Vice Dean Lori Fisher and Professor Parmer Fuller to discuss the rapidly growing field of musical theatre. They’ll also talk about USC’s newest BFA in Musical Theatre, which offers students opportunities to learn and create as composers, lyricists, book writers, directors and choreographers while collaborating with fellow students at all three schools. You’ll need to think fast on your feet in this hands-on acting workshop focused on movement techniques and improvisation. Led by SDA’s Associate Dean for Equity, Diversity and Inclusion, Anita Dashiell-Sparks, this interactive session is both intellectually challenging and playful. Learn new terminology and test your capacity for creative spontaneity. Hear from our Academic and Student Services staff about your student’s degree progress through the School of Dramatic Arts. Learn about available resources for advisement, academic support, career counseling and more. Save your questions for the Q&A following the presentation. Lunch will be served. Get an insider’s view of the design and production process of the current play in Bing Theatre with USC School of Dramatic Arts Director of Production Elsbeth M. Collins, stage management and design students. You’ll get a behind-the-scenes look at lighting, sound, stage management and design from the students working on the show. Feeling funny? Join fellow Trojan Family Weekend guests for a chance to step up to the mic and get a crash course in stand up comedy. A lecturer in the School of Dramatic Arts and veteran stand-up comedian, Judith Shelton has performed at iconic venues including Comedy Store, The Improv, the Laugh Factory, Second City and Comedy Central Stage. Catch a performance of Street Scene in the Bing Theatre, and Bus Stop or When You Comin’ Back Red Ryder? in the Scene Dock Theatre. Purchase tickets online. Thursday, October 11, at 7:30 p.m.
Saturday, October 13, at 8 p.m.
Sunday, October 14, at 2:30 p.m.
Friday, October 12, at 7:30 p.m.
Saturday, October 13, at 2:30 p.m.
Use promo code SDATFW when purchasing tickets online, on the phone or in person to receive $3 off a $15 general admission ticket to Street Scene. Limit four tickets per person. Promo code is not valid for Bus Stop or When You Comin’ Back, Red Ryder?